Medtronic Foundation will present the 18th annual Whole Heart Golf Tournament on Monday, June 17th, 2019 at the Dellwood Country Club. 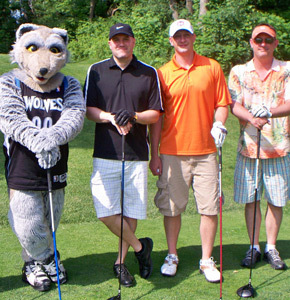 The golf tournament is hosted annually and is a four person scramble format with fun field events and contests. Prizes for women, men, mixed and senior teams. We ask that volunteers arrive at the Dellwood Country Club clubhouse at 11:00 for a brief volunteer information session and lunch. Volunteers are part of the fun outside from 11:45 to 5:30 hosting activities on the golf course. Golfers will wrap up play at about 5:30 and dinner will be served at 6:00. Volunteers are invited (and encouraged) to stay for dinner. Please email Alison if you would like to receive volunteer information for the 2019 Whole Heart. Thanks for considering sponsoring the tournament or donating a silent auction item. Please provide details via the forms below by June 1st. Please contact us if you have questions regarding sponsorship or donation. Check out pictures from the 2018 Whole Heart Tournament!